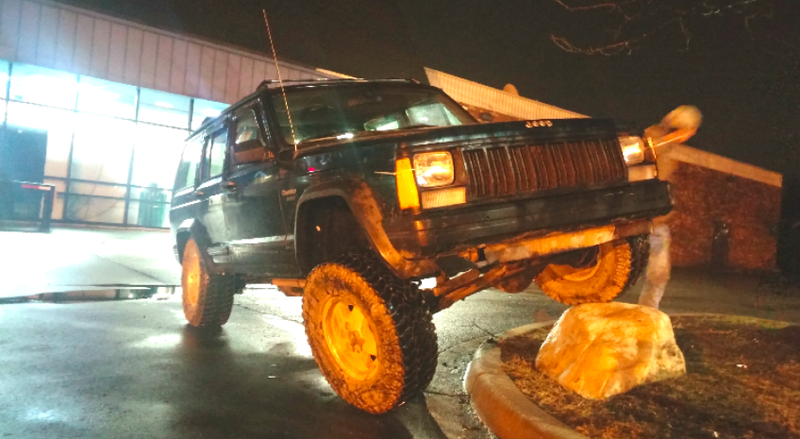 The $600 Jeep XJ flexes on a rock in a nearby strip mall. This weekend was a major success for my $600 Jeep XJ destined (hopefully) for the 50th Easter Jeep Safari in Moab, Utah. With help from friends and readers, I did some serious wrenching. But unfortunately, we uncovered two major problems—problems that are likely to bring this build down to the wire. If you’re just joining the Project Swiss Cheese disaster, I mean, build, here’s the gist: A few months ago, I purchased a rusty Jeep XJ $600 in hopes to prove to the world that you don’t have to be rich to off-road with the big-shots in Moab at this world-renowned annual festival of Jeep off-roading. Last week, I posted an update on the build; there was still tons of work to be done. Luckily, this weekend, readers and friends came together and whittled those “tons” down to just a few pounds. I’m eternally grateful for all their help. Here’s what we accomplished together. The XJ sits in a garage as its suspension parts are removed. A new u-joint is ready to help the Jeep crawl up slick rock. And not break. My u-joint on my front passenger axle shaft was completely destroyed, as was apparent by the loud clunking noise the car made when accelerating or coming to a stop. So, to replace it, my friends and I pulled the wheel, brakes and wheel hub. This all required liberal use of a MAPP torch, breaker bar and electric impact, but it was all fairly straightforward. Well, except for the bit where we broke our wheel hub trying to remove it with a sledge hammer. We probably should have used a puller for that, as that ended up being a $70 mistake. That’s 12 percent of what I bought the car for, and probably close to 50 percent of the car’s true value. Sigh. Clay bolts on the new hub. We expected to just throw in the u-joint and hub, and call it a day. I had just checked the passenger side for ball joint play, and it seemed fine, but apparently I hadn’t been thorough enough, because while we were bolting on the new hub, we found that the ball joints were actually toast. Santiago heats up the lower ball joint before trying to remove the knuckle from the axle. Removing the knuckle from the ball joints required many, many Joules of heat from that MAPP torch and lots of banging with the sledge hammer, but it came free after some heavy whacks. Pressing out the ball joints from the axle, though, was a chore, even with the ball-joint removal tool we borrowed from O’Reilly Auto Parts. We ended up having to get creative with a large metal plate, but eventually, we got it done. Clay and Santiago remove the upper driver-side ball joint. In the end, we wound up replacing hubs and ball joints on both sides, and a u-joint on the passenger’s side. It probably took a total of six hours, but there’s no more clunking! Project Swiss Cheese gets a new radiator, water pump and thermostat. As a former powertrain cooling engineer, I had to replace all my cooling-related hardware, because a breakdown would be downright embarrassing and I’d never hear the end of it from my pals at the automaker I worked for. So I’ve installed a new water pump, thermostat and radiator. While removing the old radiator, I broke one of the hard-lines that sends automatic transmission fluid, or ATF, to the in-tank cooler in the radiator. An auxiliary transmission oil cooler sits in the front of the cooling module ready to keep the AW4 nice and cold during rock crawling. Because I was too lazy to replace the hard-line, and because XJs’ AW4 transmissions are notorious for overheating during low-speed rock-crawling, I installed an auxiliary transmission oil cooler at the front of the cooling module just behind my grille. A toggle switch works as the electric fan activator. That transmission cooler, which I picked up at the junkyard a few months back for about $15, sits in front of an electric “puller” fan. That fan, which normally cuts on when the driver requests AC or when coolant temperature gets too high, has been malfunctioning lately, so we hot-wired it. My friend Stephen, in the picture below, is a wiring wiz-kid. A true magician with the electrons. He wired in the toggle switch for the electric fan, installed a radio and speakers, and fixed my power windows. Stephen works his magic on the electrical system. Thanks to Stephen, we won’t have to drive 1,750 miles with no power windows (I have no AC, either) and no radio, and I won’t overheat when I’m stuck in traffic. The 31-inch Goodyear Wrangler Authority all-terrains are on. Those tires, available only at Wal-Mart, are basically a poor-man’s Goodyear Wrangler Duratrac, and they look mean. I pulled mine off my beloved ‘92 Jeep XJ, the one that sits in my driveway with no engine after the unfortunate aquatic incident. Clay grinds down the bolts on the gas tank skid plate so they won’t hang up on rocks. Sometimes, when you’re Jeeping on a budget, you’ve got to get resourceful. So when I saw that a skid plate at a junkyard had giant rust holes, I bought it anyway. Twelve bucks? How could I resist that deal? The only scrap metal I had in my garage was a pair of license plates, so we bolted those on to cover up the rust holes, ground down the bolt ends, and now she’s ready to protect my gas-tank from sharp rocks. Philip holds the gas tank skid plate. He’s proud of his rust-hole patch job. I had just swapped the transfer case chain with a new one, only to find that the transfer case is shot. There’s still a lot of work to do. The transfer case, for example, is leaking all over the place. I had just cleaned the case, re-installed the cover with the shiny new chain, and now it leaks like mad. I should have known the case would drip oil, though, seeing as it was completely devoid of fluid in the first place, and a few quarts of ATF don’t just evaporate. That bone-dry transfer case must have botched something with my transfer case, because when I pulled it into four-wheel drive, it locked up and sent my car screeching to a halt. That was frightening. I’m not sure why that happened, as the linkage seems to be fine. Subsequent shifts into four-wheel drive have been drama-free. My transfer case has a severe leak. Luckily, I was proactive and bought a spare transfer-case—one that currently sits in the back of my XJ, putting that rear floor-board to the test. If replacing the rear shaft seal doesn’t fix the leak, or if the transfer case acts up again, I’ll just swap in my spare. A transfer case sits on my rear floor board praying it doesn’t fall through. A loud, rhythmic chirp is coming from my accessory belt. Diagnosing belt noise may sound like wrenching 101, but this one’s proving to be a bugger. The noise isn’t a typical squeal that you’d expect from a loose serpentine belt, it’s a rhythmic and loud chirp. And the noise goes away when I squirt water at the belt, making me think there’s a pulley alignment issue. The pulleys seem to rotate nicely, though, and it sounds like the noise is coming from the bottom, so this may be an issue with my harmonic balancer. I’ve looked at the balancer and had a friend rev the engine, and it doesn’t at all look like it’s wobbling, so I’m not sure on this one. I hope it’s not the balancer, as pulling that will take a few hours, but if it is, I needs to get done before I leave on Friday, because if that balancer lets go, things could get ugly. The rear drum brakes are locking up and getting very hot. My rear drum brakes are locking up, and I haven’t figured out why. I’ll re-bleed the lines and re-adjust the screws and hope they sort themselves out. The smell of burning brakes gets old. So I’ve got four days to either fix or swap a transfer case, and maybe a harmonic balancer. Should be fine, right? Well, not really, as I really should get some miles on this thing to shake out any quirks before I start the journey. Something tells me that won’t happen, though, and Thursday will be an all-nighter. Wish me luck, and thanks again to everyone who helped with this insane experiment.